Because Rome is so rich in must-see tourist sights, many visitors neglect the surrounding area. Some guidebooks don't even give the Lazio region a chapter to itself, limiting their coverage to the capital city. It can't be denied that Rome does have masses to offer the tourist and you're unlikely to run out of things to do. But for visitors who are staying more than three days, visitors who are returning to the Eternal City for the second time (or third, or fourth) or for those who have simply had enough of the city, there are wonderful places easily reachable by car or public transport for a day trip or a weekend away. Day trips from Rome make a refreshing break from the chaos, noise and pollution of the city. They are also refreshingly affordable, since trains in Italy are an economical means of transport, and the blue Cotral buses which serve the area are frequent and cheap. Rome is surprisingly close to the sea and to the hills, and you don't have to travel far to appreciate completely diverse scenery. In the summer you can do what the Romans have been doing for millennia, and take a break in the nearby hills, where the air is noticeably cooler and fresher, and you may even find a breeze. 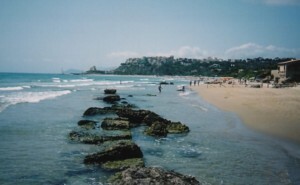 Alternatively you can enjoy a day at the seaside, visiting one of the busy beaches near Rome, or finding more tranquil stretches of sand to the south. Back in the 18th Century, English aristocrats on their Grand Tour spent considerable time in the smaller towns and countryside of Lazio. Many of the views and antiquities they admired have changed surprisingly little, and it's an atmospheric experience to follow in their footsteps around the cascades, temples and great houses of Tivoli, Frascati and the rest of Lazio. 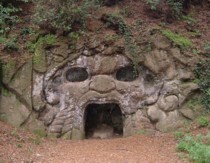 Lazio is full of sites of enormous archaeological interest, including very fine Etruscan remains in the north of the region as well as later Roman ruins. Striking temples of varying scale can be seen at Terracina, Palestrina and Tivoli, where you may find yourself the only tourist marvelling at ancient columns and picturesque views. The absence of crowds is an appealing feature of Lazio's lesser-known hilltowns; although many tourists do visit Frascati (chiefly for the wine), and Tivoli (for the fountains of the Villa d'Este), you will find little tourism in other destinations - and even those towns are often surprisingly neglected. If you're feeling more ambitious,it is easy to travel further afield. Swift train services run into Tuscany, Umbria and Campania, and your options include Florence, Naples, Orvieto, Spoleto, Siena. It is quite feasible to visit Pompeii in a day from Rome. However if you are a repeat visitor to Italy, you may wish to leave these out-of-area sights for separate holidays and stick with more local destinations while you are staying in Rome. Listed below are some ideas for good day trips from Rome. They range from the most popular excursions to some more off-the-beaten-track suggestions. All the destinations featured are reachable by public transport, although the journey and planning may require some patience. Some places are on railway lines, though you may need to catch a connecting bus at the station of arrival. Others rely on Cotral's longer-distance bus services, which depart from bus stations outside central Rome, connected to the centre by the Metro. If you are fortunate enough to have a car, you'll be able to see much more of Lazio at your own pace. Some of the towns and villages offer a lot to do, others are simply pleasant places to potter, take in the scenery and enjoy a peaceful lunch. > Lazio region - including more ideas for destinations within reach of Rome. One of the most popular excursions from Rome, Tivoli is an attractive hill town where you can visit the water gardens of the Renaissance Villa d'Este. Outside Tivoli (a separate bus ride) is the Roman Villa Adriana, Hadrian's Villa. Combining both makes a very long day trip; either is a good standalone destination. Frequent buses from Rome. Sperlonga is a small seaside destination with a beautiful long sandy beach, a pretty white-painted town on a headland, and some interesting Roman ruins. A train journey followed by a bus ride. Frascati is an attractive hilltown popular with Romans for a weekend excursion. 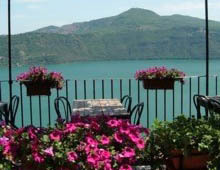 Fresh air, renowned food and wine, and the chance to visit the gardens of the Villa Aldobrandini. Reachable from Rome by bus or train. On the coast south of Rome, this resort has a sandy beach, a historic old town and a ruined Roman temple high above the sea. Reached by train and bus. 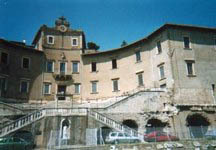 Palestrina is a small village built over the remains of a huge ancient temple. There is a museum to visit containing a famous mosaic depicting scenes along the River Nile. An off-the-beaten-track day trip destination. 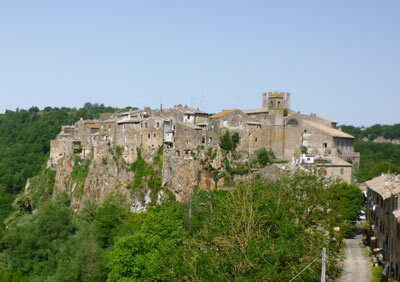 A medieval hill town which has become a kind of artists' colony, thirty miles north of Rome. Low-key but atmospheric. Reachable by bus from Saxa Rubra. The Castelli Romani are a group of hilltowns outside Rome, and include Frascati (above) and Castel Gandolfo, summer residence of the Pope. Low-key, attractive and peaceful destinations, they are a great option for getting out of the city and into the countryside. The main attraction is the atmosphere and the chance for leisurely lunches and cheap local wine. But there are also gardens, villas and archaeological sites to see. The towns are connected to Rome by a little railway line and by buses from Anagnina metro station. Famous and beautiful Italian gardens at the Villa Lante in northern Lazio. A car is better than public transport for this excursion from Rome. 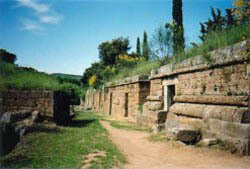 Cerveteri's big attraction is its Etruscan necropolis, an ancient city for the dead with house-like tombs set in the peaceful countryside. A bus-ride from Rome. 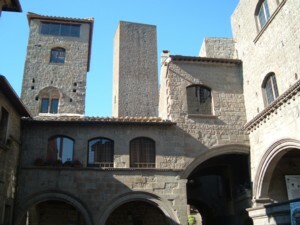 A picturesque medieval town in northern Lazio, Viterbo has a long and illustrious history and was once the seat of the popes. The journey from Rome takes up to two hours, and can be made using trains (from Flaminio or Ostiense) or buses (from Saxa Rubra).